It was a case of ‘Groundhog Day’ as Crawley failed to take their chances and paid the price as they lost 4-0 to Wembley on Saturday. Trailing 1-0 to an early goal the game was in the balance until the 77th minute when the hosts scored three times in just eight minutes. Green had begun brightly, Charlie Clayton’s shot saved by Przemyslaw Mierzwa, Shaun Foley firing wide, while Daly played in Clayton, who could only shoot straight at Mierzwa. However, in the 19th minute, the inevitable happened as Wembley took the lead with their first real opportunity. A disputed free kick was fired in from 18 yards and took a wicked deflection as new signing Daniel Gould made a fine reaction save, tipping the ball on to the bar, only for Wayne Walters to react first and head home. Green replied with a cross from Sam Willett which went wide off the knee of fellow debutant Tyler Ingham, who also set up Clayton, his shot saved by Mierzwa. After the break, Crawley dominated, Ingham’s effort going wide and Tom Peverall shooting at Mierzwa, who also saved from Clayton and Shaun Foley. However, Green were unable to turn their pressure into goals and in the 77th they were caught on the break as substitute Adrian Dinham played in Zaied Sabti who fired the ball past Gould to make it 2-0. 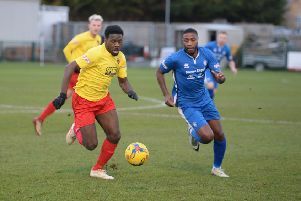 Four minutes later Dinham killed the game off with the third and, Wembley were awarded a soft penalty in the 85th minute, Tresors-Jordy Mumbiny converting. This Saturday, Crawley Green entertain Leverstock Green.